The owners of what was once Birmingham’s most iconic hotel have gained planning permission for a £30 million scheme to restore the building to its former glory. 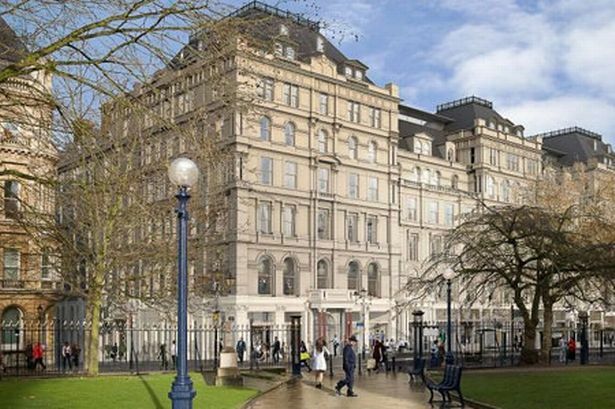 The Grand on Colmore Row will be transformed into a luxury hotel with 152 rooms and eight new suites under plans by owners Horton’s Estates. Designs drawn up by architect Berman Guedes Stretton also include restoring its listed facade and grand staircase, renovating its famous Grosvenor Suite and moving its main entrance on to Church Street. Project director Hamish McMichael of Berman Gueddes Stretton, said: “Hortons’ Estate’s planned restoration and refurbishment of the hotel will be rescuing a building of grace and character that is an important landmark for Birmingham. The historic Grade II* listed Victorian hotel has been derelict for 11 years and it was feared that the cost of restoration within the strict English Heritage and conservation area guidelines would prevent its revival. But the restoration project had a smooth ride through the planning process after receiving the unanimous backing of city councillors. The architects behind the refurbishment of the eight-storey building were praised as providing a shining example of sympathetic restoration by the council’s planning committee. Coun Barry Henley (Lab, Brandwood) said: “I must congratulate the architect. This is a wonderful conversion which will not only allow the hotel to provide modern air conditioning but also improve the viability of the hotel. Hortons chief executive Tony Green described the feedback as “very encouraging” and added that due to the complexity of design and restoration work time scales had slipped by a few weeks and that, all going well, they expect to reopen the Grand in spring 2014. The professional team on the refurbishment includes project manager Trebor Developments, planning consultants Drivers Jonas Deloitte and facade engineers Arup.